Robots don't rule the world yet, but someday . . . well, we'll leave that up to the science fiction aficionados. In the meantime both students and educators alike can turn to the Center for Educational Technologies® for an introduction into the world of robotics. Using the variety of robotics offered through LEGO® (yes, the building blocks company), Dr. Meri Cummings of the center leads a variety of robotics-related endeavors. 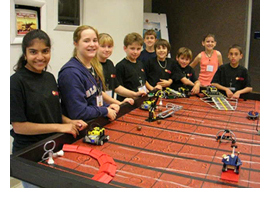 In fact, since 2005 the Center for Educational Technologies has played host to the annual West Virginia FIRST LEGO® League robotics tournament. For information about starting a robotics team, robotics summer camps, tournaments, parent/educator workshops, and more, visit our Robotics website.